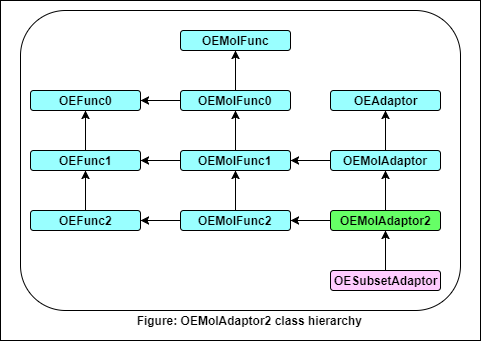 The OEMolAdaptor2 class is a pure virtual base class which defines the interface for classes which adapt or transform molecular coordinates, gradients, and hessians of a given OEMolFunc2 during an optimization. Adaptors are useful in cases where energy, gradients and hessians evaluation for a molecule or conformation are performed in Cartesian coordinates, but the optimization is done in different coordinate system. Defines the interface for resetting the molecule function, OEMolFunc2, within a OEMolAdaptor2 derived instance. Any molecule functions which are “owned” at the time of calling this method will be deleted. If the value of a second argument passed to the method is true, the adaptor derived from OEMolAdaptor2 will take ownership of the memory of the molecule function, and will call the molecule function’s delete operator when either the destructor or the current method is called.